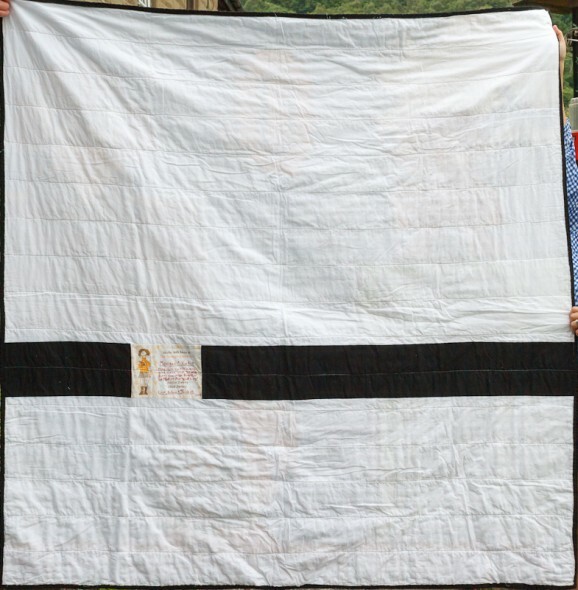 Other posts on this project: Next Quilt, Next Quilt Pt. 2. We just got back from England on Wednesday night after spending 2 weeks driving 900 miles around the country, stopping in 10 different towns, and introducing H to a whole lot of friends and family. My brother-in-law Morgan got married on Saturday in London, which was the reason we made the trip during the Olympics. I have a ton of photos to post over the next few days, but I can finally reveal the details of the quilt I’ve been working on this summer. It was a wedding present for Morgan and Katie, from this Carolina Patchworks pattern. I love Adam’s brothers and Morgan’s wife Katie and their two daughters Cleo and Livi. They’re very cool, and Morgan works for a big video game company. 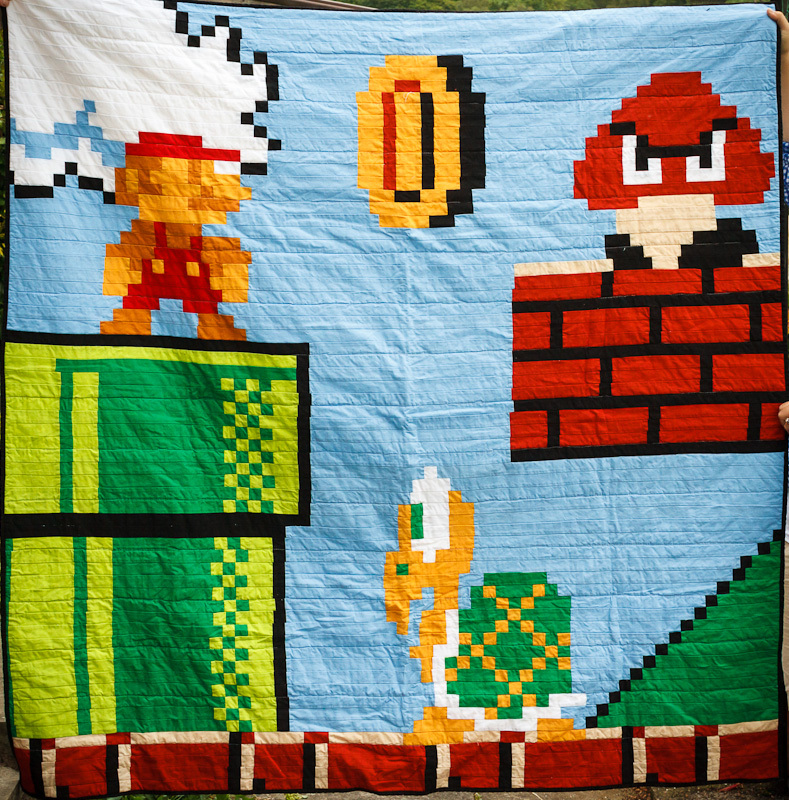 So obviously they needed a wedding quilt, but it needed to be irreverent and fun. Which this is. It’s also the most difficult quilt I’ve made to date, and I wasn’t always sure I’d make it out alive from this quilt, and of course I notice all the little mistakes in this. But overall I think it came out beautifully, and Adam and I were so excited to give it to them. I’m pretty proud of myself for getting it done in time. We had a little photo shoot in his mom’s garden a few days before the wedding. I now wish I’d dressed a little smarter, but what can you do? I kept the back really simple, with a message to the happy couple from Adam and me. At one point I had this crazy idea that I would make it reversible and put Donkey Kong on the back. That was a VERY short-lived plan. Adam is pretty jealous of this quilt now. 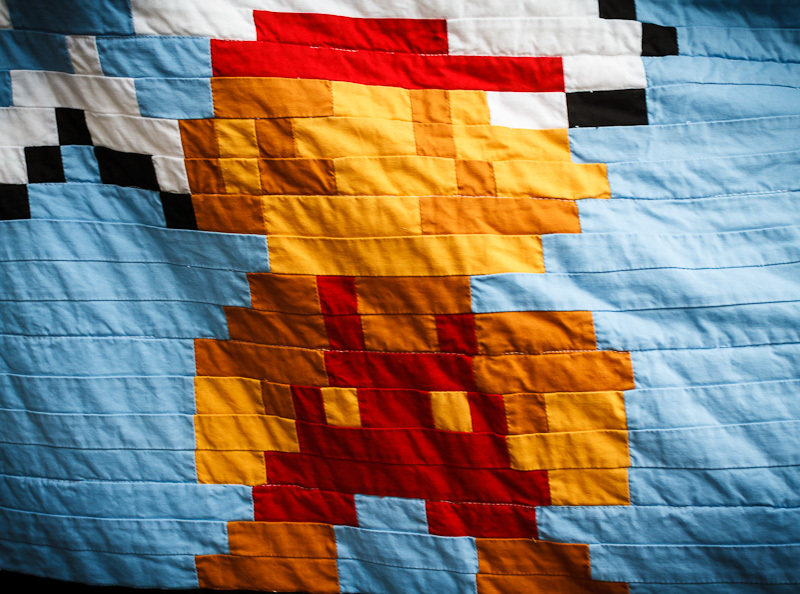 I guess I’ll have to work on one of the other video game patterns for his next quilt. 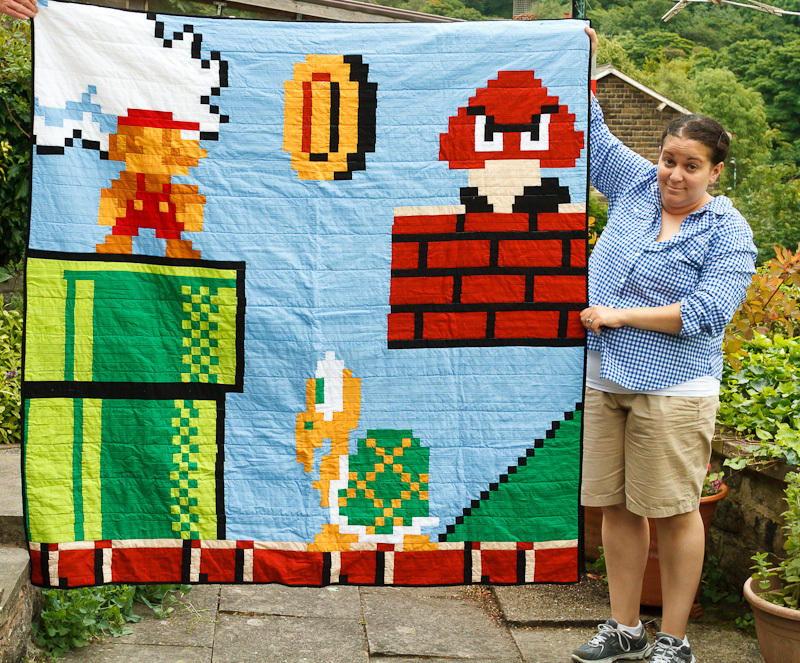 That is a pretty damn sweet quilt. Bravo! I lived in Atlanta during the ’96 games. For the two weeks of the games, traffic and crowds were sparser than average if you weren’t within a square mile of a venue. I had been assuming it was the same in London. Was your experience different? Was England more congested than usual? It is AMAZING and more. This wonderfulness is a tribute to your creativity and patience. P.S. And, isn’t it nice to know that it was soooo appreciated?